Happy early birthday to my Dad! I love you and I can't wait to celebrate this weekend! Also, Happy early Independence Day, Y'all! A lot of changes have been happening in America lately. 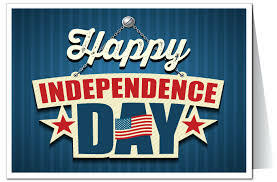 Some of you may think these changes are positive and some may find them negative but hopefully, on the fourth, we can all get along, wear our red, white and blue and celebrate the holiday! I weighed for the first time since April this past Saturday. It wasn't great but it also wasn't as bad as I thought. 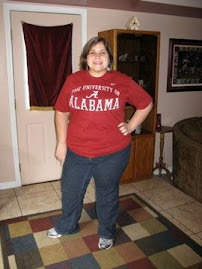 I am going to start weighing in weekly again. My depression regarding this whole weight gain thing hasn't really gone anywhere but like every Monday, I've started the week in hopes of being good and today, I have been. I will have some recipes to share next week but I was lazy today and only have a couple snacks to share. 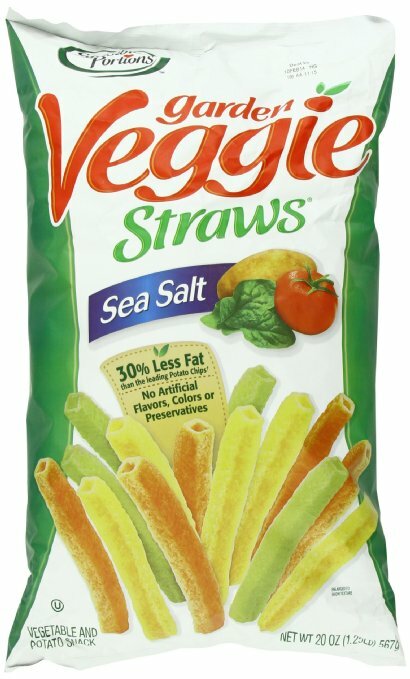 The first snack is Veggie Straws. I love these things! They are made with vegetables and taste like potato chips. The best part about them is that you can eat about 40 of them for around 140 calories. They go great with burgers and sandwiches. I also dipped them in some ranch dip this weekend. They are my new favorite, go to munchie. 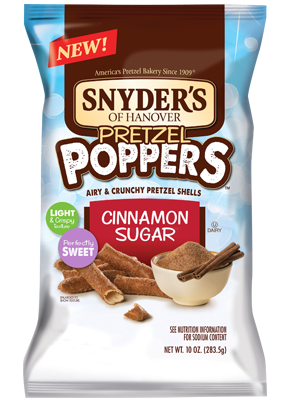 The other snack I wanted to share would be from Snyder's. They are Cinnamon Sugar Pretzel Poppers. These little guys are great because they are essentially a hollowed out pretzel so you can have way more for less calories. They have a nice salty/sweet combination. I highly recommend getting them. 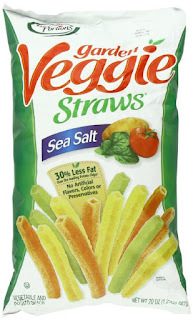 Both the veggie straws and the pretzel poppers come in other flavors but I am partial to these. Once again, I'll admit I was totally lazy today so that's all I have. Here's hoping I can avoid my typical holiday binge. Have a great week everyone. Hey y'all! Yesterday was the official first day of summer but if you ask me it's been here for a couple weeks. It is SO hot! It's the time of the year where my dog flat out refuses to walk in the afternoon. I can't say I blame him though. 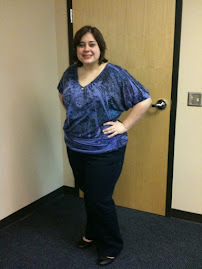 I realized today that I haven't weighed since late April. I can't decide how I feel about this. On the one hand, I know that the scale is a terrible machine that often defines your mood and self-worth. On the other hand, I would like to know what I'm working with. 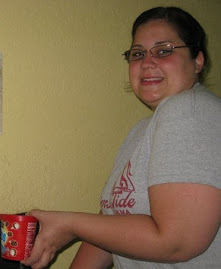 I decided to weigh on Saturday and start weekly weigh-ins again. For several weeks I've been eating right during the week and then letting go on the weekends. I want to do better. My clothes fit but are snug so it's time for some hard work and it's time to set another goal. As usual I'm searching for the motivation I once had. I have it today and that's what matters. My first goal is to have a good week AND a good weekend. Wish me luck. When I went to Manna grocery a couple weeks ago and got back bean tortilla chips, I also bought some freeze dried edamame to snack on. I've never tried it before in this form so since it was 90 calories for a whole pack, I gave it a shot. I had to get used to the texture but once I did, I really enjoyed it. Edamame is packed with protein and it's filling. I would love to find smaller packs in bulk so if anyone knows a good place for that, let me know. I was out of town last week most of the week so I didn't do much in the way of cooking. I wanted to share something I've shown before but makes for a great, quick dinner. 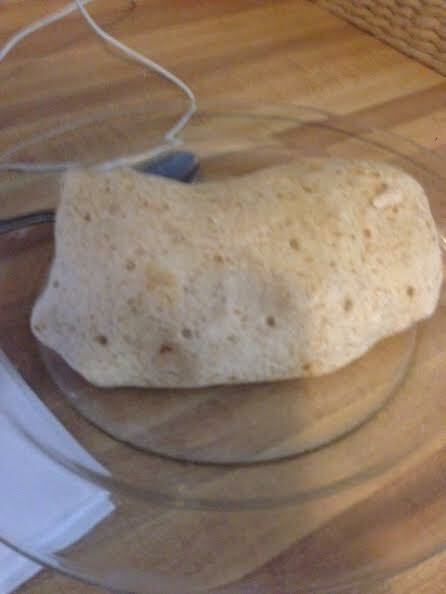 Since I'm obsessed with Moe's but have no money, I often make Moe's burritos at home. All I do is take my 90 calorie flat bread and add my favorite toppings. 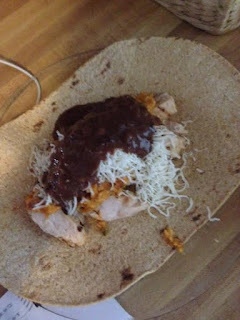 I split both the rice I bought at the grocery store and the chicken strips in half so I could make a burrito two days in a row and added cheese and black bean salsa. 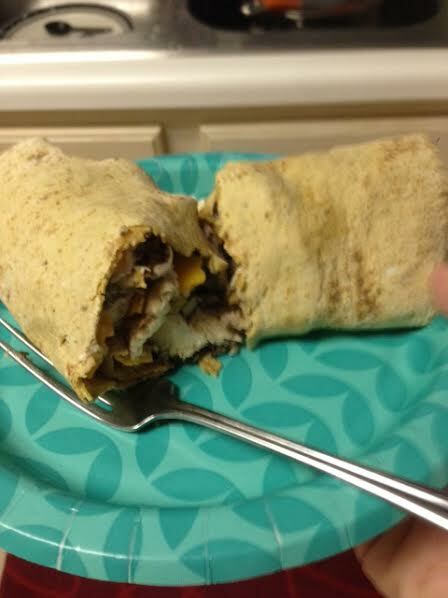 It makes a sizable burrito and it tastes yummy! These are addictive and much cheaper than going to Moe's or Chipotle like I'm tempted to do every day. 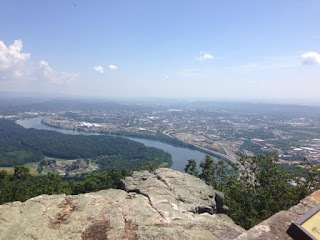 When I was in Chattanooga, I traveled to Point Park on Lookout Mountain to try my hand at hiking. I've been "hiking" I guess but not on a mountain and not to this extent. 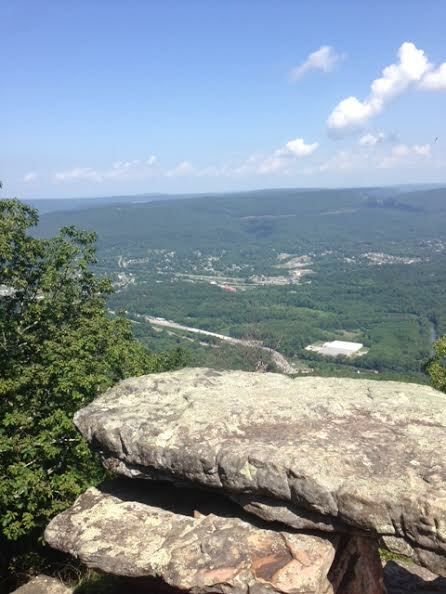 I climbed over rocks and walked along the edge of the mountain with a ledge/significant drop off to my side. I won't say it was dangerous but had I fallen or something it could have gotten interesting. It was hot and extremely challenging. I was drenched in sweat and out of breath by the end but I loved it. Sure, I'd always rather be inside watching TV but I'm committed to exercise so if I have to do it, I'd say this is one of those things I enjoy enough to do again. I'd like to have a partner because I feel like unless you're a professional hiker, operating on the buddy system is probably smart. I don't think I'd be good in a survival type environment. I hate that I have to drive so far to get to more significant mountains but it would be worth it to do it from time to time. I'm going to Colorado in less than a month with my parents and I would definitely like to try hiking while we are there. Hi everyone. It's Monday again. I'm in Chattanooga this week house sitting for my aunt. 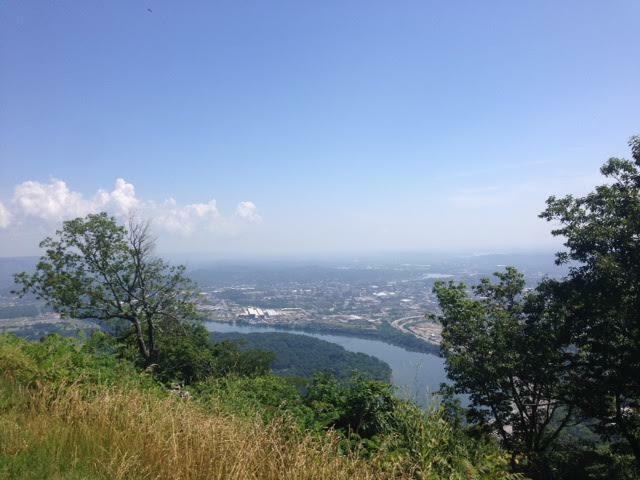 I'm thinking about going for a hike since there are mountains around. I'm not particularly outdoorsy but I love looking at mountains and I need to exercise so I may branch out. Also, I'm going to Denver in July and hiking there sounds like a lot of fun. In terms of calorie counting, I was highly successful Monday-Thursday of last week. Friday and Saturday night were both sketchy because I had Mexican food. In turn I had a bit of a downward spiral Saturday night, feeling depressed. Once again, I'm punishing myself and my goal was to stop doing that. I'm counting again today but you know, the truth is, I have nothing "figured out." I've been spending a lot of time writing about this, I'm hoping it goes somewhere. In the process, I've looked back at my blogs and I can see the momentum I had and I can also see how it's been slipping away slowly over time. It's not something I am confident will come back. I'm certainly not ready to give up but I am tired. The process continues. I may in a couple weeks but again, I'm am NOT looking forward to it so I may keep avoiding that tiny devil machine. 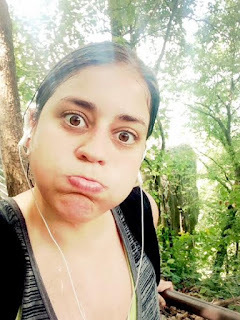 I know the intro to this post wasn't exactly cheerful but I am excited about trying new exercises and recipes and that's the truth. 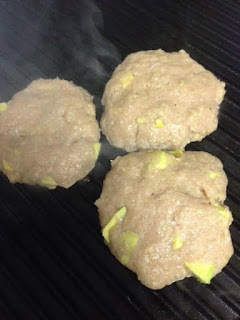 This week, I made chicken avocado burgers. I'm proud of these because they were tasty and healthy and burgers are always fun to eat. Essentially, you just take ground chicken and mix it with chunks of avocado, bread crumbs and whatever spices you want. 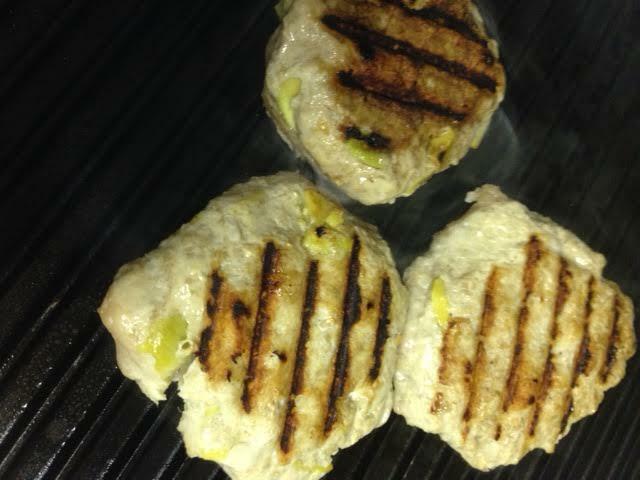 Grill them up a few minutes on each side and boom, you're done. I had them all week with cheese and wheat buns. I added lettuce and onion and I promise I didn't miss beef from this burger at all. Plus, they are super easy to make. I wanted to share a new snack. 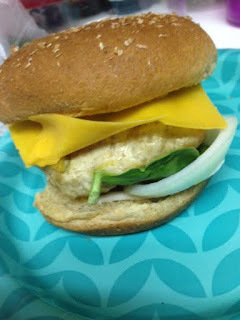 The last chicken burger I made, I put on my everything bagel thins and it was a nice touch. On the side, I served chips and salsa. 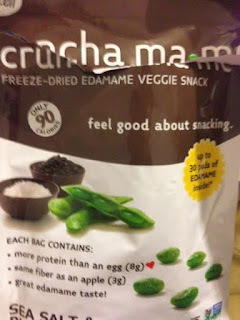 This snack came from Manna Grocery in town which has a lot of organic, gluten free items. It's a bit pricy but a fun place to find unique types of food. 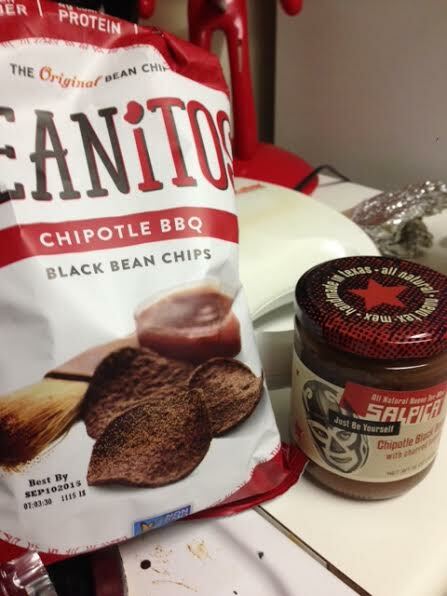 These tortilla chips are made out of corn and black beans and I got some black bean salsa to go with it. The chips tasted great! 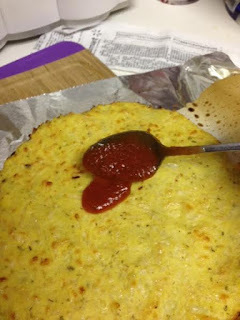 They had nice flavor and they were crispy and the salsa went well with it. 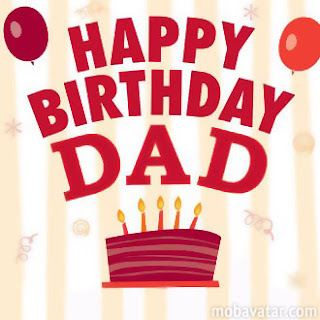 Happy Birthday to my friend, David! Howdy. If you live in the south, you know that summer is officially here. It feels like walking in a bowl of soup during the day right now when you're outside and it ain't pleasant. This is the time of the year when I do most of my exercising in the gym or in the morning because running in the afternoon in the heat of the Alabama sun is punishment that nobody deserves. 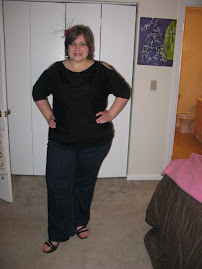 I am back to restricting calories this week but I am hoping to have a better attitude. I was slipping away from the idea of only eating when I was hungry so I am going to use my Lose It app to make sure I don't eat out of boredom but that's the only app I'm going to use. Before I read "Breaking Free from Emotional Eating," I was entering all kinds of information in multiple apps and punishing myself mentally multiple times a day when I didn't do something perfectly. Now that I've had a couple weeks to reflect I've decided to keep a calorie count but not beat myself up when I make a mistake. I'm also going to continue to try and only eat when I'm hungry. I'm going to stick as close to my calorie count as possible every day but if I mess up, I mess up. If I'm too tired to do two classes at the gym, I'm only going to do one. 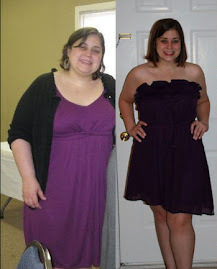 I'm also going to stay away from the scale a bit longer. I considered weighing this weekend but when I thought about it too much I felt terrified so I decided to do well and wait until I feel like the number on the scale doesn't define whether or not I'm a decent person. I know I sound dramatic but I've got some serious, scary, self-loathing behavior and I'm doing my best to work on that. One day at a time, y'all. 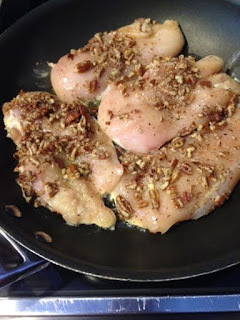 Last week, I went to the store and bought 4 large chicken breasts in an attempt to make Pecan Crusted Chicken. Ian requested this recipe as he has had it before so I thought I'd give it a shot. 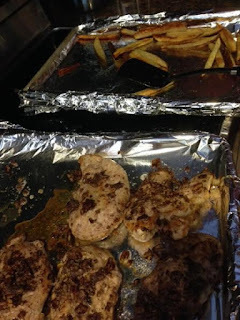 I took the four chicken breasts and cut each in half, leaving me 8 5-6 ounce breasts. 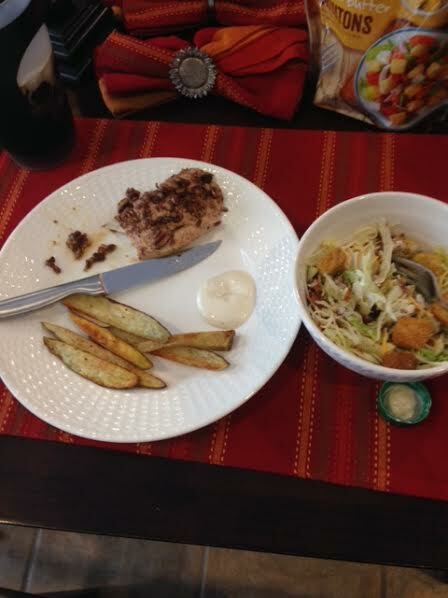 I made the chicken with oven fries and salad. 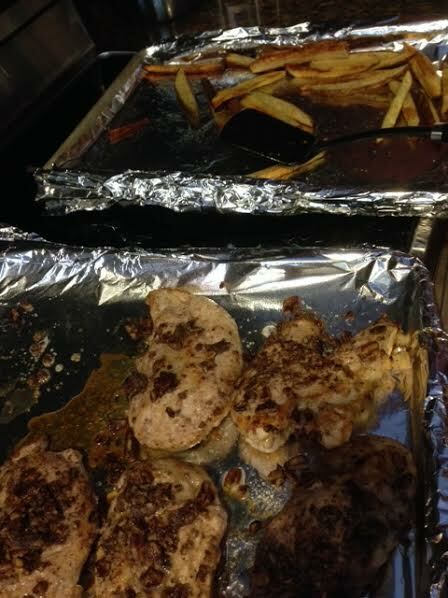 Both the chicken and the fries were pretty easy to make. 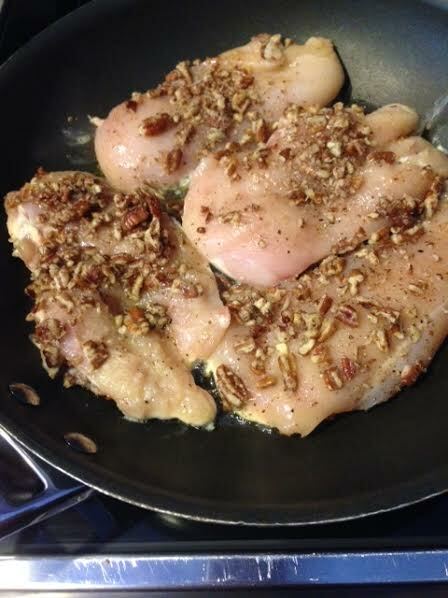 The next time I make the chicken, I will make the pecan pieces much smaller and marinate/flavor the chicken more. All you do is dunk the breasts in egg, then pecan then fry them in a skillet for a few minutes on each side (I used a bit of olive oil) and then bake them for about 10 minutes. 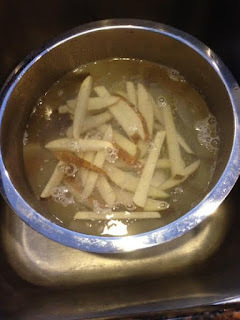 For the fries, you chop up potatoes into fry shapes, soak them in water, toss them in oil, salt and pepper and then bake them at 475 degrees. While the fries are baking make sure to rotate the pan a couple times and jostle/turn the fries once or twice so they get nice and crispy. The chicken was cooked perfectly. It was juicy and tender. It lacked a bit in flavor but it wasn't bad. The fries were delicious. They managed to get crispy in the oven and they were a hit. 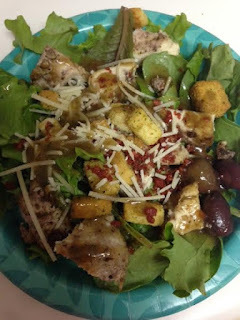 Because the chicken was missing pizzaz, I made the best out of the leftovers with several round two recipes. The first thing I did was add the chicken to a regular salad. It added a nice bit of filling protein to the boring salads I'm used to having for lunch. 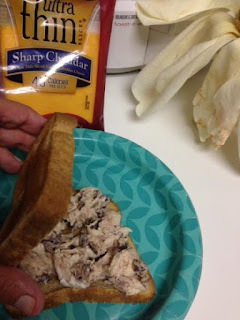 The second round of leftovers, I chopped up the chicken, added a bit of light mayo and garlic powder so I could make a chicken salad sandwich. The pecans made it that much more savory and the sandwich was filling and delicious. 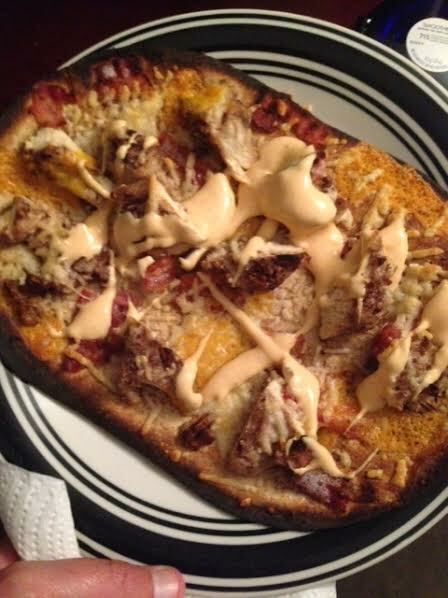 I also made a flatbread using the chicken, cheese, bacon and light buffalo flavored ranch. I think this one was my favorite. The flatbread was crispy and the ranch gave it a bit of a kick and gave it a buffalo chicken vibe Finally, I made a wrap today that had the last piece of chicken, mustard, light mayo, bacon and thinly sliced cheese. The wrap was huge so it was filling and honestly tasted just as good as a wrap from any deli. 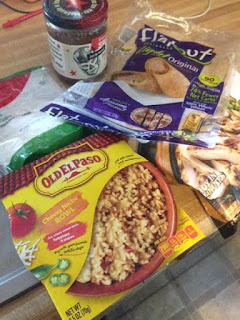 I love amping up leftovers and for $26 worth of groceries, I was able to get 8 meals. You really can't beat that. I had an amazing week filled with music! I was able to see Dave Matthews Band, Ingrid Michaelson, Nelly, TLC and New Kids on the Block all in one week. My Mom also took me to Ruth's Chris for the first time and it was honestly a life-changing experience. I had to pay $160 because my car was towed after the Ingrid concert but honestly, compared to the rest of the week I had, it was only a minor blip in my fun. I feel so fortunate in this life! Hi All! I hope your week started off well. I hate to brag but my Monday consisted of mostly time by the pool. I'm house/dog sitting for my friend Nish so her dog Coco and I had the laziest day ever and it was nice. I'm trying to be a bit more productive now but I don't expect much from myself. Last week I shared some epiphanies with you after reading a book called "Breaking Free from Emotional Eating." This past week, I went diet free and attempted to trust myself to eat when I'm hungry and stop when I'm not. It's funny because the concept is to stop thinking so much about diet and punishment but this week all I could think about was food. Am I eating enough? Am I eating too much? Do I feel light? Well, I would say until yesterday I did really well with food. I ate healthy all week and I felt as if I only ate when I was hungry and I stopped when I was full. I had a couple of nights where I had too many drinks. The problem is that when I don't eat as much I need to remember I don't need as much to drink. Friday night, I was faced with Mexican food. Mexican food and pizza are danger zones and this week I ate both (3 different kinds of pizza). I did well. What I ordered wasn't healthy but I ate a third of it and Cassandra and I had a lot of chips left in the only basket we got. For me, this is a huge accomplishment. I can eat two baskets of chips myself. I had one margarita as well. Later, when I felt hungry, I ate a bit more of my dinner. 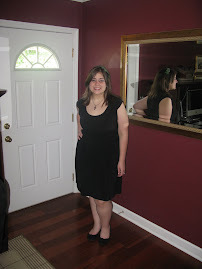 I also went to a wedding. I kept my portions small and didn't eat cake (though I really wanted to). Yesterday was the only day that was questionable. I ordered Dominos and I would say it was somewhat successful because even though I ate past the point of being satisfied, I only had two pieces with two breadsticks. This may sound like a lot but believe me when I tell you if I put my mind to it I can eat 5 pieces of pizza plus cheese bread. 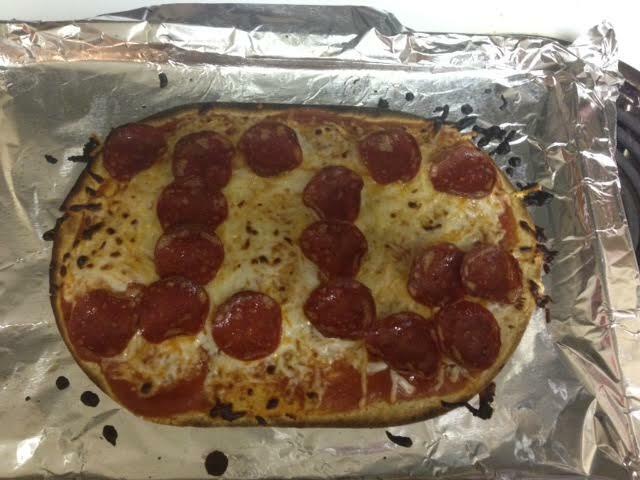 If it's a thin crust, I can eat the whole thing. So, limiting myself to two was a big accomplishment. Today, I ate one piece and one breadstick for lunch. I'm trying to get rid of the stuff. Sunday dinner with the family was the worst. I went way overboard with mac & cheese and felt pretty miserable and guilty afterward. Not sure how I'll combat that meal but I'm a work in progress as usual. All in all, I noticed places for improvement and I'm still terrified of gaining weight and my body image is not where it needs to be but I think this is a positive experience so far. It's what I need right now. Like I said, I'm not saying I will never diet again but I'm going to try this for awhile and stop punishing myself. I hope you all give yourselves a breather sometimes too. Even the easiest life is hard sometimes. As I mentioned above, I had three types of pizza. Dominos isn't exactly a beacon of health but I made two pizzas last week that won't leave you feeling guilty. 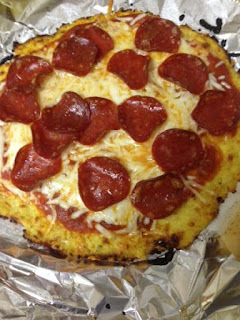 The first was a cauliflower pizza. I took a break on cauliflower for awhile because I was a bit burned out. I have tried to make cauliflower tortillas in the past and it was a giant fail but I was determined to make a cauliflower pizza crust so this time I meticulously obeyed every detail and it turned out really good! I will say if you detest cauliflower, I still don't think you'd like it. Cauliflower has a taste for sure. If you're on the fence about it, give this recipe a try. 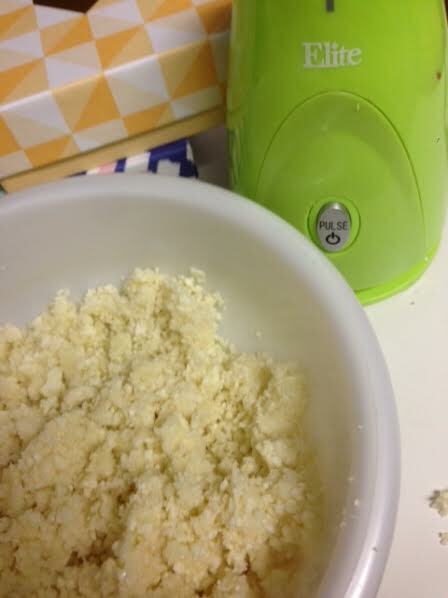 Processing the cauliflower is kind of a pain but other than that, it's not too difficult. All you do is take fresh cauliflower (you'll want 2 to 3 cups) and put it in a food processor to make what they call cauliflower "snow." It needs to look almost minced. 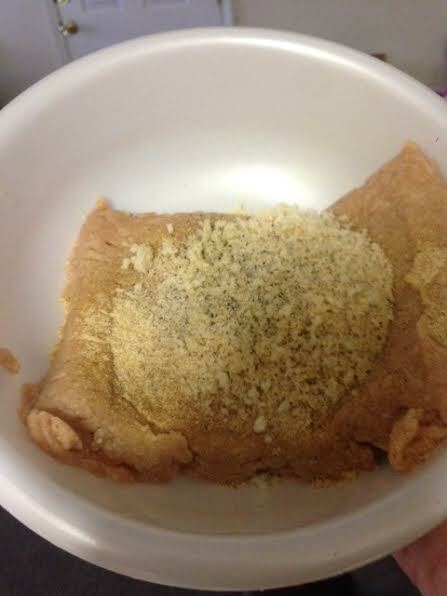 Then you heat it in the microwave and once it's cooled, you wring out the excess water with a towel. Get out as much of the water as you can. 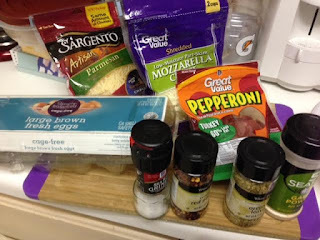 Once you do that, you combine it with one egg, 1/4 cup mozz, 1/4 cup parmesan and whatever spices you want. It will become a consistency that allows you to mold it. 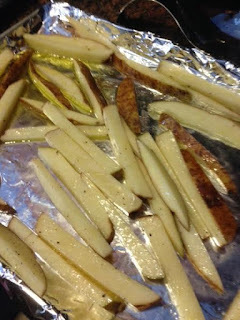 Put it on a baking sheet that is sprayed with Pam and lined with aluminum foil and parchment. Push it out into a circle that looks like a crust. 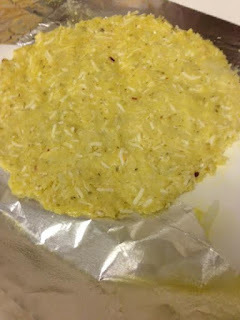 If you have a pizza stone, slide the aluminum and parchment onto it, if not just pop the pan in the oven. 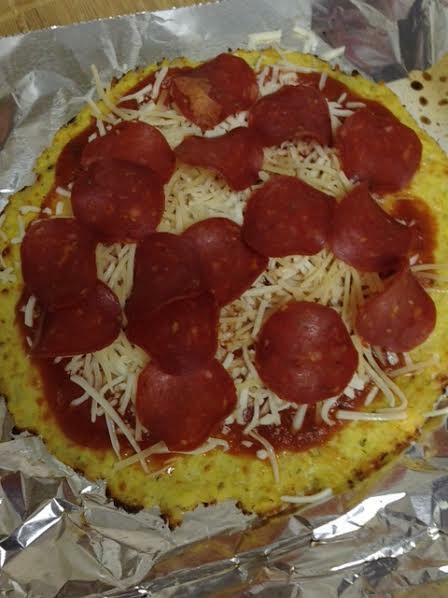 Bake the crust a few minutes (350) and then take it out and apply toppings. Pop it back in until it's all bubbly and brown. Let it cool. Enjoy. The edges were crispy and the cheese was yummy. 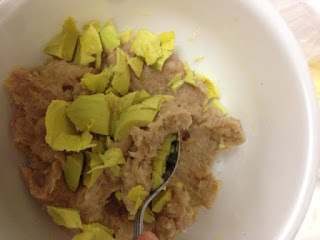 I won't make it all the time because like I said, it's a bit of a mess and kind of a pain but it would be a great recipe for kids (young or old) if you are trying to hide veggies in their food. 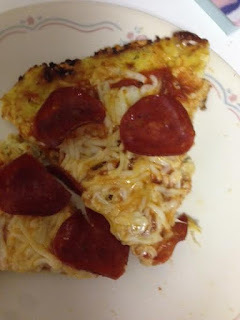 I also made a pizza that you can be done with in 5-10 minutes. 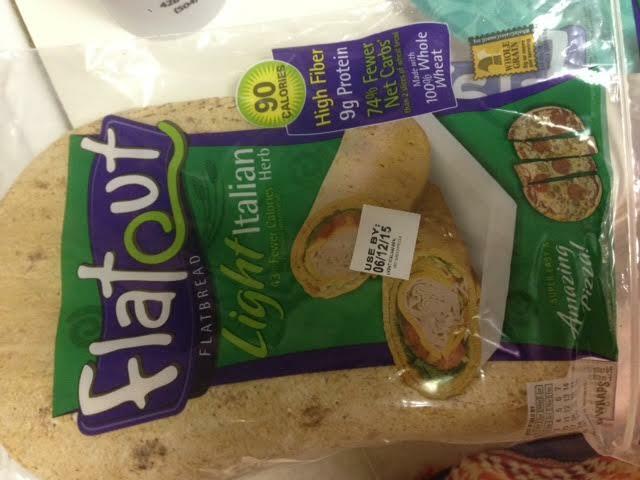 I found these big flat breads in the deli section at the store. They are only 90 calories and are huge in terms of diet bread. All I did here was turn the broiler on, put the flat bread on a cookie sheet that I lined with aluminum foil and sprayed down, topped with pizza sauce, light mozz and turkey pepperoni and broiled until it was browned and the cheese was melted. 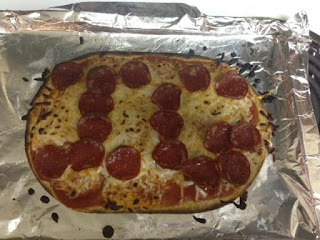 I put the pepperonis in the shape of Ian's initials because we shared it. It was cute at the time but now it feels a bit embarrassing. Anyway, I was starving after a couple cocktails Tuesday. He and I shared this and it hit the spot. 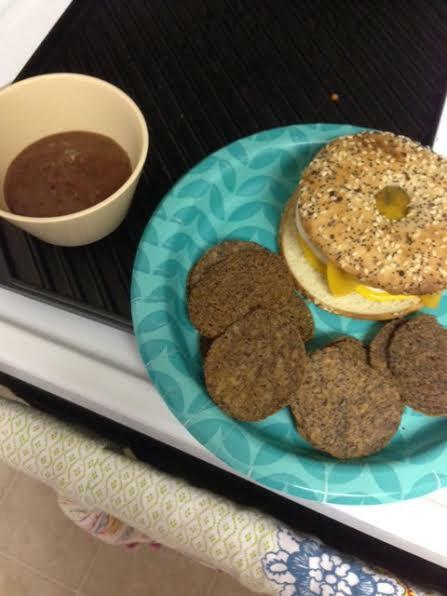 Can you imagine how many calories I saved by making this instead of getting a Baconator like I have so many times. It's delicious too! Finally, I have a quick throw together that is a departure from pizza. I have shown this before but I wanted to remind you again since it's so yummy. Zucchini and squash aren't really allowed on the slow carb diet so it's been awhile since I had it. 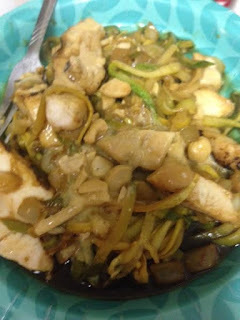 I used my veggie noodle maker and made cashew chicken "Lo Mein." It's so easy to sauté the "noodles," add chicken that is cooked already, soy sauce, peanut sauce and a few cashews. I even drizzled just a TINY bit of shrimp sauce on top. It's like I'm getting Japanese food at home and it's so much better for me! I hope you all have an awesome week!